Nora Reed Heineman-Fleck lives in Albuquerque, New Mexico where she plays with bismuth and meteorites for Mama’s Minerals. By night she thinks really hard about bombs, villains and the hairstyles of video game heroines and makes bad art. She can be found on Tumblr and Twitter. My state is on fire and I’m thinking about science fiction. A flashback: here I am in 2000– I know it’s 2000 because I watched some of the news coverage of the fire from the airport in Albuquerque, waiting for a plane to come in, so it’s pre-9-11. The Cerro Grande fire is sweeping across northern New Mexico; threatening– and eventually burning– homes. The sky at sunset is a brilliant orange and the smoke in the air doesn’t hurt my lungs so much as make me aware of them in a way I usually am not unless I am running or otherwise exerting myself. And I could be rewriting history a bit here, to make this a better story, but when I think about it, that orange fire is one of those weird New Mexican experiences that primed me for strangeness– that is, for science fiction. I’m going to make a bold claim here, and that is that New Mexico is the most science fictional place in the world. We have the landscape for it. Carlsbad Caverns is such a strange, alien environment that going inside the caves feels like entering the mouth of a living planet, saliva drip-drip-dripping from it’s immensely slow but menacing jaws. Jim White, discoverer of the caverns, thought that he was descending into hell as he explored them, and areas like Devil’s Spring and the Boneyard still hold somewhat dire names. 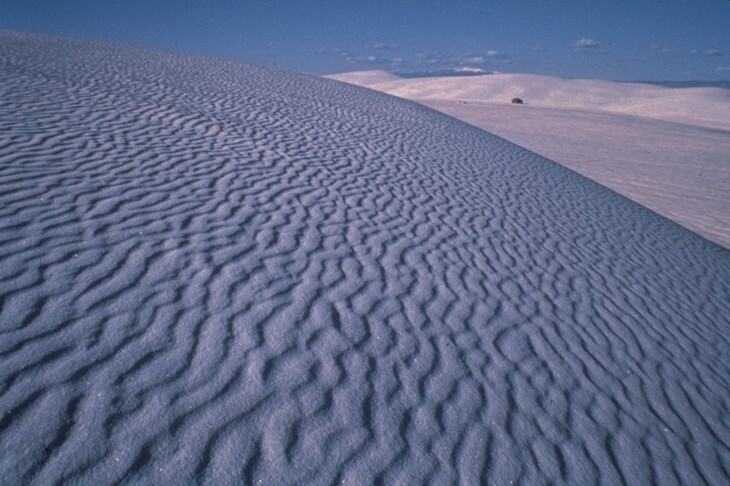 White Sands National Monument, a bit northeast of Carlsbad, is miles of sand dunes big enough to hold plenty of worms or fremen; the dunes move around constantly and so creating roads is difficult. The last time I drove past White Sands the dunes had shifted and overtaken the fence between the highway and the National Monument. But it’s not just the landscape. The atomic bomb is from here, and the more I learn about the Manhattan Project the more it feels like a fabricated story. Oppenheimer is said to be the father of the atomic bomb, but really he’s just the only person in the world that rolled high enough Intelligence, Wisdom and Charisma scores to manage the top secret, international community of scientists that the US Government hid away on a hill in the New Mexican desert. Read a bit about the stories of the creation of the bomb and they all feel like fiction– the Soviet spies meeting surreptitiously in Albuquerque, confirming their identities with matched halves of a Jell-O box, Richard Feynman learning to open locked cabinets containing nuclear secrets, even Oppenheimer’s iconic “I am become death” quote, and you’ll feel like you’re reading the notes and ephermera of a rather eclectic world of science fiction. Radiation is worked into the soil here, more metaphorically then physically. It’s always weird to talk to about nukes with people from out of state because nuclear weapons are a little bit personal here. I don’t work at the lab, but you can’t throw a stone around here without finding someone who does; growing up it was one of those standard professions you knew some of your friends’ parents have. It’s not just the labs, though. We have the only facility in the country for holding nuclear waste in the Waste Isolation Pilot Plant; where radioactive waste is stored in salt mines that will grow around it until it’s encased in salt; it won’t be safe for 10,000 years. How do you warn future generations about that? By burying multiple “information rooms” and discs of granite, aluminum oxide, and fired clay in multiple languages, of course. It’s like they were building reality to make better fodder for post-apocalyptic novels. New Mexico has the second largest deposits of uranium ore in the country and a controversial history of lung cancer in miners. You know that episode of Firefly where they go to the mining town and everyone has a lung disease? It’s a little like that, except the lung disease is cancer. We don’t have any operational mines now, but the boom-bust cycle of those mining towns is worked into Grants, New Mexico and won’t probably ever come out. And that’s just the solid facts about radiation; the rumors are something else. Stories about forests where you shouldn’t eat the game because it’s too radioactive, places where you shouldn’t breathe in the dust you kick up because there’s uranium in it. We’re seeing it now; the Los Conchas fire seems to be making Twitter vibrate with anticipation that Area G will catch fire and release radioactive smoke into the air. While I’m on rumors, let me veer off of radiation and point out Roswell, just a couple hours’ drive north from WIPP– another staple of science fiction lore, right in my little state; a town economically dependent on an accident with a weather balloon that happened over half a century ago. Roswell is an icon, almost a point of pilgrimage, a town that feels like living in a broadcast of Coast to Coast AM. And what all these places have in common is that it’s the stories of them, the rumors, the people, that make them such rich fodder for the sci-fi imagination: the dunes overtaking the fence, the superhuman charisma and intelligence of Robert Oppenheimer, Carlsbad Caverns as an entry into hell and the buried tablets for future generations above WIPP, the radioactive smoke and soil. There comes a certain point where the rumors, the speculation and the truth all combine and create this strange atomic culture. That’s the air New Mexico breathes, and we’re all a little alien, a little nuclear, as a result.